The Malaysian government has amended the Act on 16 January and expanded the scope of WHT from onshore-only, to both onshore and offshore, effective from 17 January 2017! For the past few months, many business owners here in Malaysia especially those who use foreign Internet services are confused (and very worried) with the amendments to the Finance Act expanding the scope of withholding tax. Read on if you are using services from Google, Facebook, Amazon Web Services (AWS) etc. Bear in mind that I am not a tax or legal expert, I am just trying my best to understand and explain all these tax jargons in the layman way. Officially and legally it sounds like this: "Withholding tax is an amount withheld by the party making payment (payer) on income earned by a non-resident (payee) and paid to the Inland Revenue Board of Malaysia." More information is available at the LHDN website. 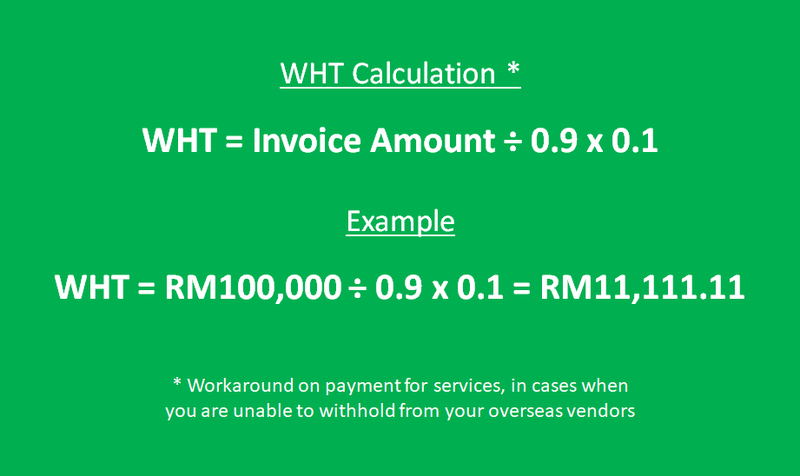 In layman terms, if you are paying non-local invoices or vendors, you need to withhold an x% of the invoiced amount and pay to LHDN (IRB Malaysia), and the balance to be paid to your foreign vendor. 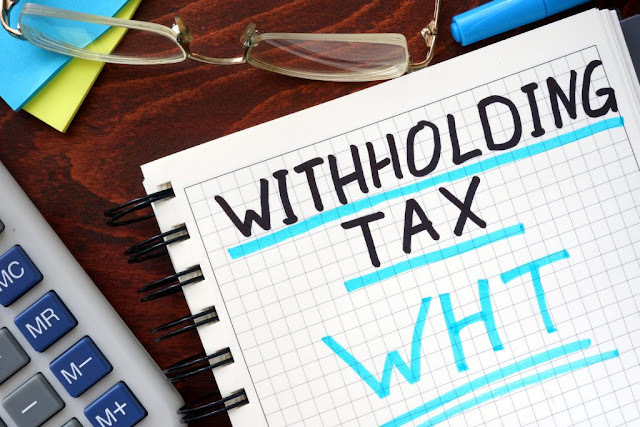 In fact, this withholding tax (in short WHT) has been around since Income Tax Act 1967, which covers various categories including payment for services under "special classes of income". Most Internet or IT businesses wouldn't have any issue prior to 2017, as payment for services like Google, Facebook, AWS etc. are sort of exempted as the services are performed offshore a.k.a out of the country. Before this, WHT only applicable for foreign vendors who physically render their services within Malaysia a.k.a onshore. The thing here is, the government has amended the Act on 16 January by expanding the scope of WHT from onshore-only, to both onshore and offshore, effective from 17 January 2017! That means if you are paying foreign vendors for services (and royalties too), you are responsible to withhold the payments regardless where the services are performed. Whenever there are changes to the tax policy like this, you tend to hear opinions like "the government has run out of money, that's why we are being taxed left and right." In fact, you might want to understand that WHT is a good tax scheme, otherwise revenue sucked from our country by foreign companies is being taxed in their own country, not here. This is a tax policy commonly practised in most countries to protect the country's interest. However, there are a lot of confusions in the market on the execution, whether should we withhold 10% of payments to parties like Google, Facebook, AWS etc? In this case, your vendors will then claim back the 10% from their local government. Sounds straightforward but it's not. There are limited resources and guidelines available online so far. After months of checking with tax consultants, trips to LHDN office, conversations with WHT officers, I have finally gathered some facts and opinions to share with all of you, so read on! If you ask tax consultants, most will tell you that you need to withhold 10% of the invoiced amount and pay to LHDN. At least, that's the typical answer I hear from my end. Well, that's not exactly true but we can't blame the tax consultants, their modus-operandi is to play safe, which is quite understandable to get your business risk-free from potential penalties from LHDN. So, SHOULD we withhold? We will come back to this slightly later. The next question is CAN we withhold 10% and pay the balance to Google, Facebook & co? For example, when Facebook bills you RM100,000 on advertising spend, can you withhold RM10,000 (pay to LHDN) and make RM90,000 payment to Facebook? You could imagine that it is not possible, right? We have checked with Google and Facebook personnel and long story short, the answer is no, the payment must be made in full without WHT deduction. 6. Tax liability: The amounts charged to you by us, whether through your credit card or otherwise, may be subject to and include applicable taxes, including without limitation withholding taxes. It is your responsibility to remit any taxes that apply to your transactions. You agree to indemnify and hold us harmless from and against any claim arising out of your failure to do so. 7. Payment: ... Charges are exclusive of taxes. Customer will pay (i) all taxes and other government charges and (ii) reasonable expenses and attorneys’ fees Google incurs in collecting late payments. It's clear that giants like Google, Facebook & co are expecting full payments but your business is at risk if you don't withhold and pay LHDN. So what should we do? Just in case if you are wondering, the answer is no. At the moment, there is no way for Google or Facebook to invoice you from a Malaysian company. You can refer to a sample Google invoice below, which is billed from their entity in Singapore. Facebook on another hand bill from Ireland (tax haven?) as you can see from a sample invoice below. So remember this, Google invoices from Singapore, Facebook invoices from Ireland, regardless whether you are paying via credit card or monthly invoicing, while Amazon and many others bill from the United States. What is Double Taxation (Avoidance) Agreement, in short, DTA? As the name suggests, a DTA is an agreement signed between two countries enabling the administrations to eliminate double taxation. In layman terms, DTA is to avoid scenarios, for example, revenue by Google in Malaysia is being double-taxed by both Inland Revenue Board in Malaysia and Singapore. 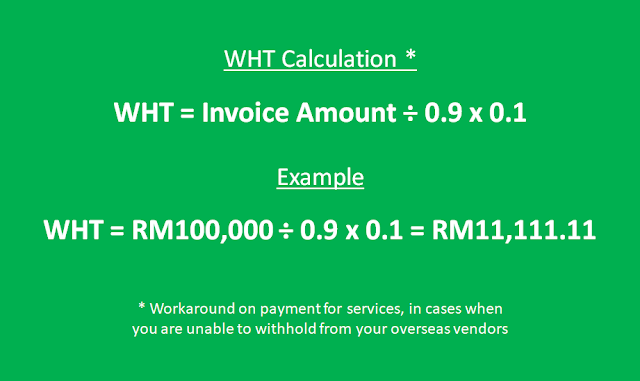 Therefore, the WHT tax rate can be lower than 10% (for technical fees, or services) if there is a DTA agreed between Malaysia with the specific country. You can refer to the DTA rates by country from LHDN , and pay attention to Technical Fees column (which is the closest one to payment for services). 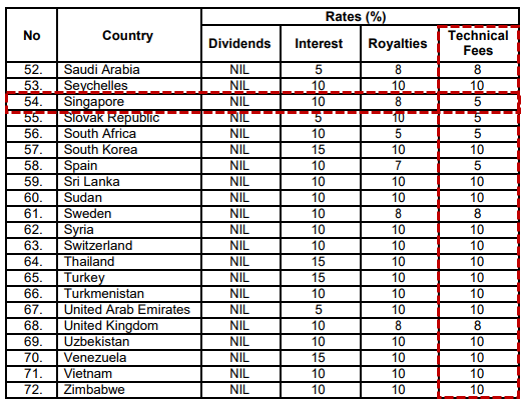 While WHT tax rate with Ireland (Facebook) remains at 10%, it seems to be 5% for Singapore (Google) under DTA. Does that imply advertisers in Malaysia can withhold 5% instead of 10% WHT on payments to Google or any Singaporean vendors? Does Technical Fees cover, or equivalent to payment for services? Some businesses out there are already withholding 5% WHT for Google, and 10% WHT for Facebook, but HOLD ON! 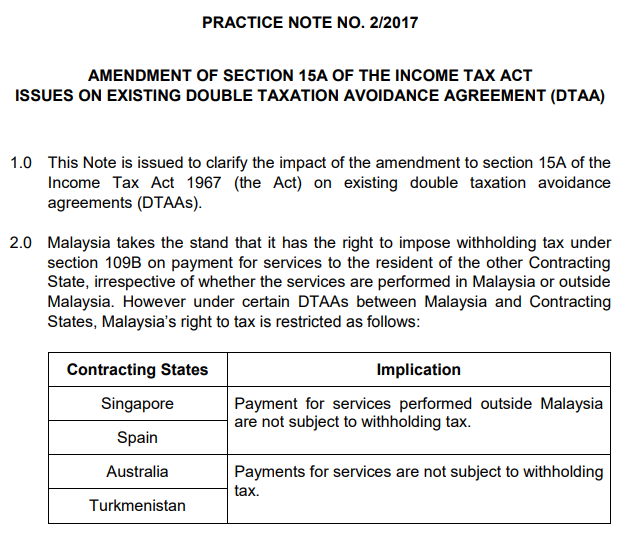 We are made aware recently that LHDN has released a practice note: "However, under certain DTAs between Malaysia and Contracting State, Malaysia's rights to tax is restricted as follows: (read the table below)"
As you can see from the table above, payment for services performed outside Malaysia is not subject to withholding tax, for Singapore and Spain. After verification with LHDN officers, it is clear that we are not required to withhold payments to Google, or any other vendors in Singapore (plus 3 other countries above) whom you pay for services. A big relief on payments to Google, but unfortunately there isn't any similar waiver for Ireland under DTA. In this case, advertisers need to factor in 10% WHT for Facebook ads as the invoice is originated from Ireland. However, we cannot just withhold 10% when we are paying Facebook ads, remember? This might be even more impossible if you are paying Facebook ads via credit card, as your card will be charged full payment every single time. Again, businesses are now stuck in between. While LHDN is enforcing you to withhold, but your big overseas vendors wouldn't allow you to withhold as they are expecting full payments. If you don't comply, 10% penalty will be imposed on the unpaid withholding tax. In addition, you would be disallowed for tax reduction for the gross amount of the payment made to the foreign vendors. Where the payer fails to pay or pays withholding withholding tax late (not within the period of one month after the date of payment / crediting to the NR payee), he is imposed an increase in tax of a sum equal to 10% of the amount which he fails to pay is imposed. Imagine if you have spent RM100,000 on Facebook in 2017 to date, and you have never complied by submitting WHT to LHDN, the penalty will be RM100,000 x 10% WHT + 10% penalty = RM11,000! In order to avoid penalty and consequences, the safest way for now, is to pay WHT from your own pocket when you are unable to withhold the payments to your big foreign vendors. Back to the RM100,000 Facebook ad spend example earlier, should you fork out 10% or RM10,000 to pay as WHT? The answer is no! In this pay-from-your-own-pocket workaround, LHDN recognizes RM100,000 as the payment being made to Facebook "after being withheld". So, RM100,000 is supposed to be the 90% of the "total amount of RM111,11.11". So take note, it is ~11.11%, not just 10% based on this WHT calculation. WHT officers from LHDN did suggest that whether can foreign vendors like Facebook invoice us RM111,111.11 instead of actual spend of RM100,000, which I think is unlikely. Of course, above is just a suggestion or guideline for your to consider and evaluate, or whether to risk the potential consequences to your business in the future. If you have never submitted WHT before, just refer to form CP37D (for special classes of income) and submit it to the nearest LHDN branch. A friendly reminder here as this is not just limited to Facebook advertising, WHT applies to AWS, Dropbox, Shopify and so many other Internet services out there which are billing you beyond the DTA coverage. One workaround you can consider is to change your service provider! Nobody can really avoid Facebook advertising though but for example, if you are using MailChimp high-volume plan, why not consider migrating to GetResponse enterprise plan in which they are able to bill you locally? Take time to evaluate if you are able to ditch foreign services and go with vendors who can bill you locally or even from Singapore. Not only it saves you WHT dollars but the hassle of submissions too! I doubt many businesses here would agree that Malaysia is a business-friendly environment so it is more like helping yourself instead of expecting help from the authorities. Having said that, we are still hoping for a solution between our tax authority with the big foreign vendors like Facebook. The WHT shouldn't be paid out of our pockets, which defeats the purpose of WHT and this causes extra burden to businesses which are already contributing, and helping the government to collect all kind of taxes. With the country on its way to digital economy transformation, and local businesses are using more and more Internet services from both local and overseas vendors, the complexity on WHT shouldn't really be a hindrance to the digital adoption for local businesses. Or at the very least, it will be much more convenient if we can make WHT payments online. It is a hassle to visit LHDN's branch every month just to make WHT payments. I hope this sharing is useful for you, feel free to share your opinion or findings in the comment box below. ecInsider: Should advertisers pay Withholding Tax on Google & Facebook advertising in Malaysia?